Just a girl spreading the word about all the fun (and probably nerdy) things to do! Have you ever been in that tight jam where you must stay awake and pay attention to something, be it school, uni, a meeting or even an award ceremony but all you want to do is drift off to sleep. Now this isn't going to tell you how to stop being bored, because let's face it, in these instances if you're bored you can't just take out your phone and start playing games. You're probably supposed to be listening, so don't go off chatting to a friend to keep you awake because in that case you may as well not turn up at all. But how do you keep your eyes open and your brain functioning? He's awake, or is he? 1. Do not shut your eyes or lay down. If you're thinking to yourself "I'll just shut my eyes and listen, I'm still playing attention it's all good" Wrong. It never works - don't fool yourself. 2. Bring a drink. No, not alcoholic, but some water or a boost or something you can take a sip of to wake you up a bit. If the drink doesn't wake you, the movement should. 3. Move about, if you do get a break go for a walk or a stretch it will really wake you up and get your mental juices flowing. 4. Sit up the front. 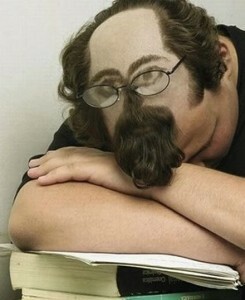 Usually the fear or embarrassment of getting caught sleeping up front is enough to keep you awake. Don't do this though if you know you'll just sleep anyways, even if you're up front. 5. Get a friend. I know I said not to, but if you have a friend who is learning the same thing and you and will poke you if you drift off, then go for it. Also the occasional giggle or comment between friends will keep you engaged and will stop you from drifting off. So there you go, try and stay awake, and if you really must fall asleep, do like Jack Sparrow and paint eyes on your eyelids! Good luck!